Thanksgiving is the American holiday that’s most associated with food, hands down. 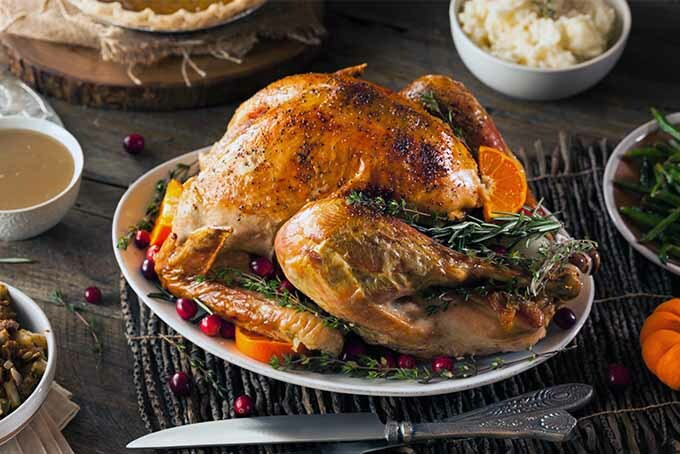 Turkey, dressing (or stuffing), cranberry sauce, sweet potato casserole, mashed potatoes, pumpkin pie… you name it, and it’s probably on the table. But how did these menu items become the norm for this day of joyous feasting, and gluttony? 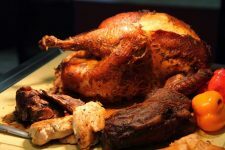 Every schoolchild has heard the story about the Indians and the Pilgrims and the first Thanksgiving, but it seems like few people actually realize what was eaten on that day almost four hundred year ago. 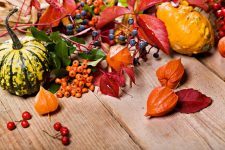 And as far as the history of Thanksgiving as an American holiday goes, that Pilgrim story might not have as much to do with our food traditions as some might believe. 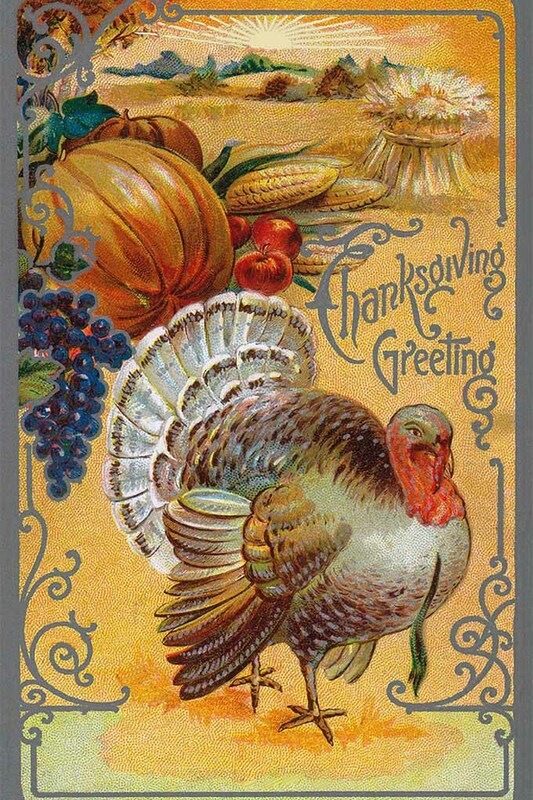 Let’s take a few minutes to revisit the original celebration of thanks that we associate with this day, as well as the history of the holiday to discover what these first Americans really ate over the course of three days in 1621, and how the food we’ll serve this November first made an appearance on the basic holiday menu that is so common today. There was no pumpkin pie on the table on that first day of thanks. In fact, very little of what those first Americans ate resembles anything that we now associate with this foodie holiday. 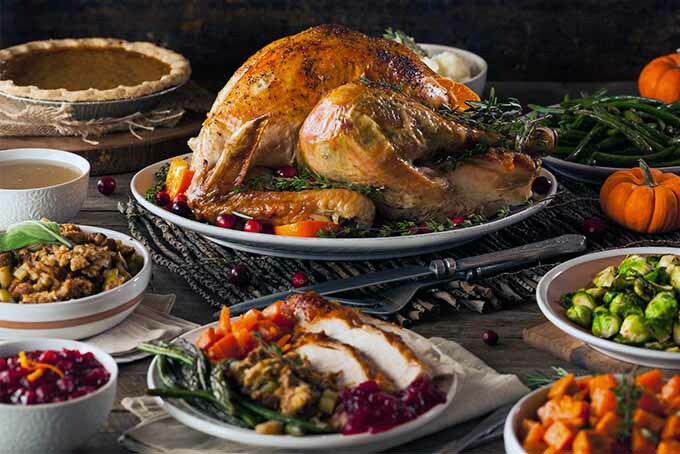 How do we know what the Pilgrims served during their celebration? Well, we actually have a couple of first-hand accounts that fill in some of the blanks, and food historians have been able to make very educated guesses about the rest. One of our original sources for this information is the Pilgrim chronicler Edward Winslow. In his journal, Winslow wrote that four settlers were sent on a “fowling mission” and that their Wampanoag friends arrived to the party with five deer. Governor Bradford also wrote of the celebration, indicating that he invited several of their local allies, including the Wampanoag chief Massasoit. His manuscript also mentions the hunting trip and the Wampanoag arrival with the deer. From these sources we know that meat was a huge part of that first gathering. 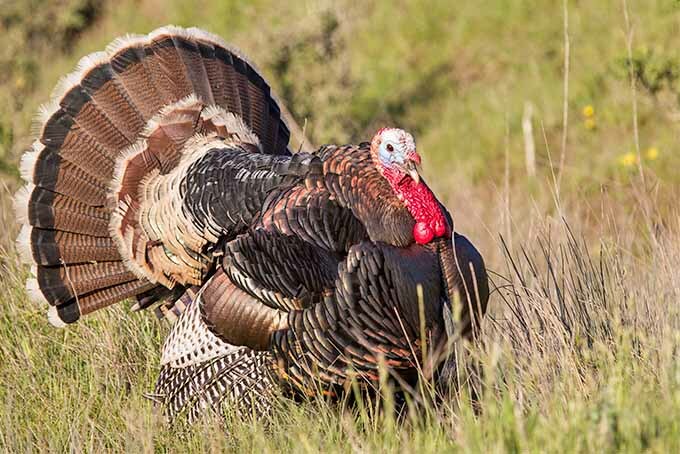 Historians know that the fowl that would have been hunted was wild turkey, goose, or duck. Passenger pigeons or swans may have also been available. 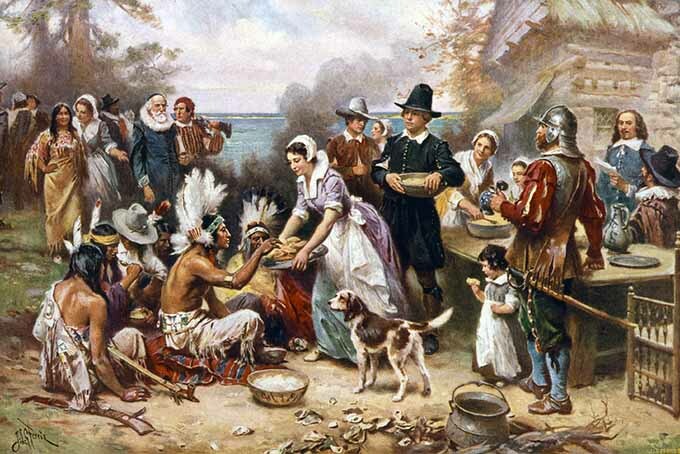 Due to the fact that the Pilgrims only would have had access to open fires for cooking, historians can also surmise the method of cooking for the meat. Smaller birds would have been roasted on spits, as would the venison after it was cut into pieces. Larger birds, like the wild turkey, would have been boiled first. After the initial cooking they may have also been stuffed with onions and herbs, or shelled chestnuts. They may have then been roasted a little over the open flame, to give more flavor. Whatever was left of the meat after the first day of the celebration would have been added to water and boiled to make a richly flavored stock. And some kind of grain would have been added to this to make a thick pottage. We know from the historical documents that Squanto showed the Pilgrims how to grow corn. We also know from later records from this time period that the colonists also grew turnips, carrots, onions, garlic, beans, pumpkins, and other types of winter squash. It’s a reasonable assumption to make that at least some of these vegetables would have also been a part of the festive harvest meal. And their Native American allies would have no doubt showed the New England settlers how to forage for nuts in the forest, so nuts also would have appeared at the feast. On the other hand, we can be sure that there was no pumpkin pie. Darn! The colonists had zero sugar, flour, or butter for a crust. If pumpkin was served, it was probably just boiled and mashed. So, for the so-called “First Thanksgiving,” the celebrants would have eaten meat, meat, and more meat, some roasted chestnuts, and maybe some boiled turnips or pumpkin. That doesn’t sound much like our annual holiday menu, does it? So where did our Thanksgiving menu come from? This is actually an interesting story in its own right. Keep reading to learn more! Just because the colonists had a banquet to celebrate their first successful autumn harvest doesn’t mean that it suddenly became a yearly event. In fact, there are only a few other mentions of such a specific autumnal feast until after the Civil War. 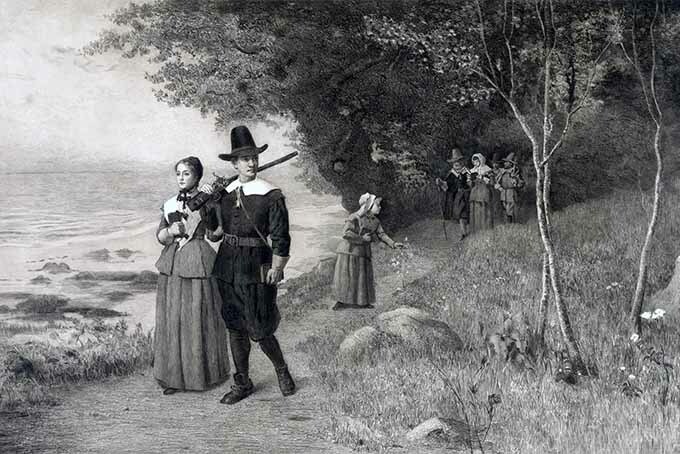 The Pilgrims enjoyed another special meal of thanks in 1623 to celebrate the end of a long drought, but we don’t find another specific mention of a day such as this, set aside to express gratitude, until 1789. That year, the first President of the brand-new United States of America, George Washington, issued a national proclamation calling for Americans to spend a day in gratitude, celebrating the end of the Revolutionary War and the successful ratification of the US Constitution. 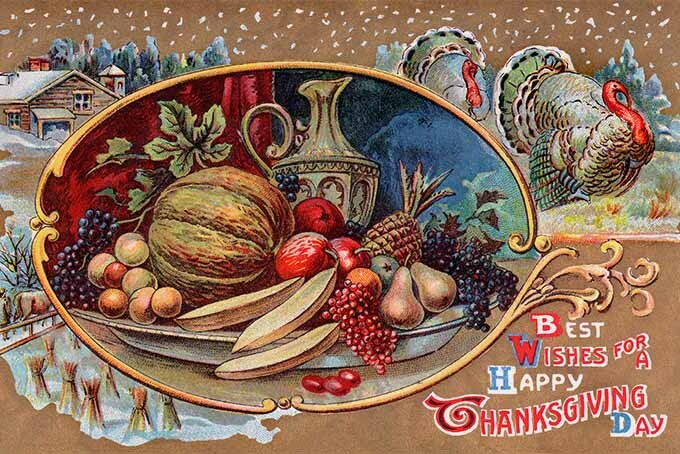 Later on, in 1817, New York became the very first state to announce an official statewide day of thanks, with all government offices closing for business on that day. Several other states followed suit in the coming years, but the specific day of the celebration was sporadic and varied from state to state. Then, in the mid-1800s, a clergyman from Boston named Alexander Young discovered the original writings of William Bradford and Edward Winslow. He published these writings under the title Chronicles of the Pilgrim Fathers. In his publication, Mr. Young added a footnote that declared this feast the first Thanksgiving. And this collection of early colonial writings, with its mention of a first Thanksgiving, caught the attention of Sarah Josepha Hale. Ms. Hale was a prolific writer and the editor of a very popular ladies magazine, Godey’s Lady’s Book. After reading Mr. Young’s work, she embarked on a seventeen-year-long campaign to establish an official national day of thanks. She wrote numerous editorial pieces as well as letters making her case to local politicians, governors, and five different presidents. Throughout this time, she also used her magazine as a platform to promote her idea to the women of the United States. Along with the magazine editorials, Hale included recipes and full menus for the special day. 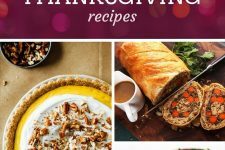 Some of the recipes she came up with or recommended included roast turkey and dressing, creamed onions, mashed turnips, mashed potatoes, and – of course – pumpkin pie. Sarah Hale also published a dozen cookbooks over those decades, which included all of the recipes she offered in the magazine and many more that she also recommended for the autumnal feast. In 1863, Abraham Lincoln was the first president to actually follow through on this idea of creating a national holiday for a day of gratitude. He scheduled the celebration for the last Thursday that November. So, a president had finally declared a national day of thanks, and Mrs. Hale’s loyal readers were more than prepared for the occasion. Thus, our modern-day Thanksgiving was born! This is the centerpiece of the vast majority of Thanksgiving tables, and we have Mrs. Hale to thank for that. With all her years of editorials and recipes basically conditioning her women readers for decades, it’s no wonder that turkey was the main meat dish at many celebrations from the start. She even featured this holiday in a novel she wrote in 1827, many years before it was a commonly recognized holiday. In Northwood, Hale vividly described the occasion, complete with a beautiful roast turkey with stuffing serving as the showpiece of the meal. 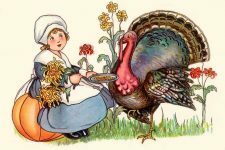 In fact, it was this novel’s success that earned Mrs. Hale her position as editor, so even before she began to print dozens of recipes in the Godey’s Lady’s Book, she was selling her idea of a turkey-centric Thanksgiving to her readers. While Mrs. Hale always featured stuffing prominently in her recipes and menus, she was hardly the first cook to think of stuffing meat. In fact, we know that this was a common cooking technique at least as far back as the Roman Empire. A collection of Roman writings entitled De Re Coquinaria, basically a cookbook, had recipes for stuffing hares, pigs, and chickens, among other animals. The stuffing consisted of vegetables, spices, nuts, herbs, and spelt (a type of wheat). 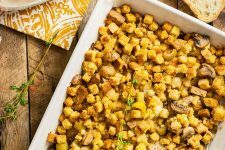 In Latin, the name for this type of preparation was farcire, which literally means “to stuff.” And so this component of the entree came to be known as stuffing. In Victorian England, when the term “stuffing” was deemed too crass for polite society, the British changed the name to “dressing.” Over time, the two titles came to be used interchangeably. In the South, we use the name “stuffing” if it is actually cooked in the bird’s cavity. The term “dressing” is reserved for the side dish that is cooked by itself in a baking dish. Another difference is that what Southerners call “dressing” is typically made with cornbread, or a mixture of wheat bread cubes and cornbread. Stuffing is more typically made from wheat bread, or mostly bread with a little cornbread added. Other than featuring cornbread, Southern dressing recipes often include a pork component such as bacon or sausage. 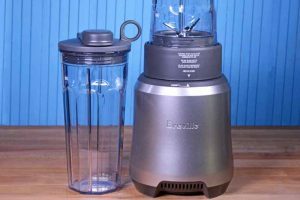 The dressing also typically includes flavorful onion, celery, and sage. This Turkey Day must-have also varies a lot from region to region across North America. In New England, chestnuts have always been a popular component of the dish. Boston-area cookbooks have long featured oyster-based stuffing recipes, with or without breadcrumbs. 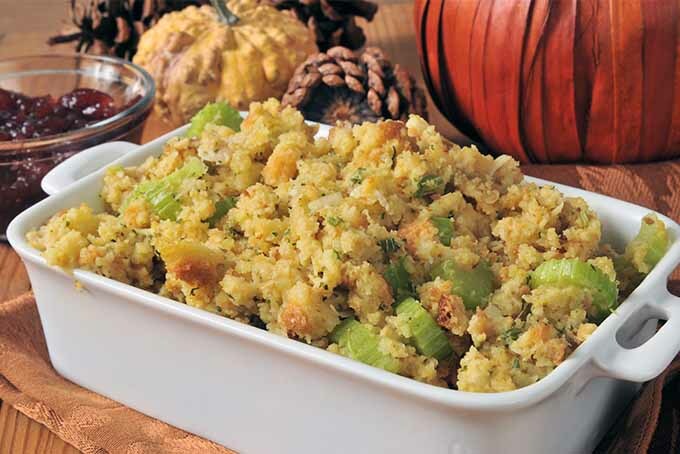 Oyster stuffing or dressing may be cooked in the turkey, or separately and served alongside. 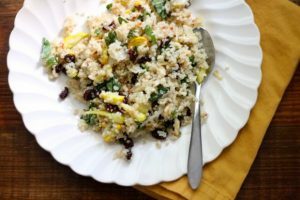 In Pennsylvania, Mennonite families created their own version of dressing that is based on mashed potatoes, and came to be known as “filling.” This casserole also includes day-old breadcrumbs and plenty of butter. In the American West, northern and southern traditions were combined to make unique dishes. In San Francisco, for example, sourdough bread became the staple ingredient, while seafood stuffing featuring all manner of shellfish was created in the Pacific Northwest. 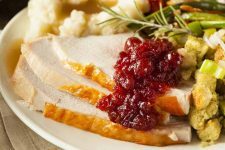 It’s worth noting that, while cranberry sauce wasn’t served by the Pilgrims at their famous banquet in 1621, the first written record of a sauce for meat made by boiling cranberries and sugar in water was made not too much later, in 1680. By the time Mrs. Hale’s followers were preparing for their first official Thanksgiving in 1863, cranberry sauce would have been a fairly common accoutrement to most meats, including roast turkey. 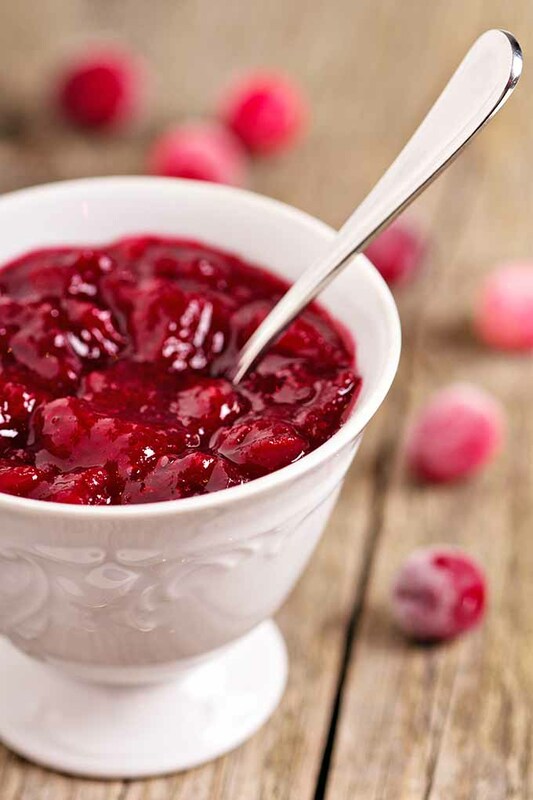 In its most basic form, cranberry sauce is made quite simply by boiling cranberries with sugar and water until the berries pop open and the mixture has thickened. To jazz it up, some recipes call for additions of orange juice, orange zest, grated or ground ginger, maple syrup, port, or cinnamon. 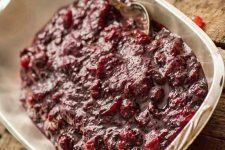 While it’s perfectly easy to make your own, canned cranberry sauce has become increasingly popular since it was first introduced in 1941. 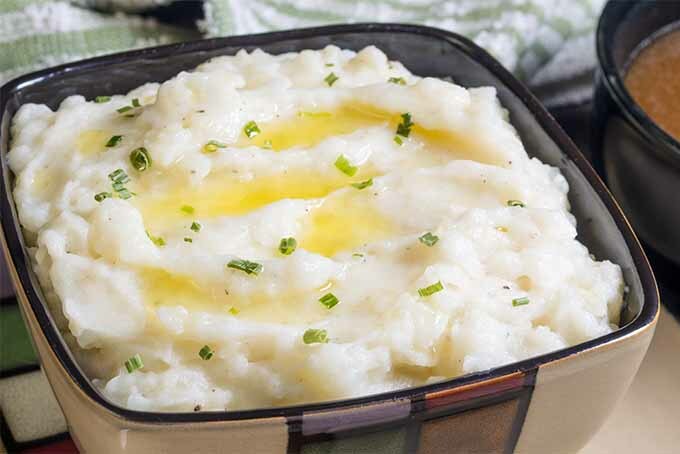 There are some records of the pre-conquest Incas of South America enjoying a version of mashed potatoes, though it bears little resemblance to the side dish with which we are familiar. The Incas would mash the potatoes and squeeze out as much liquid as possible. Then, they placed the pulp outside to freeze-dry overnight, to preserve them for the winter. In the 1530s, after the Spanish arrived in South America, families of Spanish sailors brought many newly discovered foods back with them, began growing potato crops along the coast of northern Spain. Sir Walter Raleigh brought the tuber to Ireland. Potatoes arrived in the American colonies in the 1620s, by way of Bermuda. But that was just a chest of potatoes being sent to Virginia as a gift. The first real potato farming didn’t occur until the early 1700s, when some Scotch-Irish immigrants in New Hampshire started growing them. Still, the idea of a mashed potato dish similar to what we eat today didn’t appear until 1747, when a recipe for them was included in an American cookbook, The Art of Cookery. At the time of Mrs. Hale’s campaign for a fixed Thanksgiving holiday, she included recipes for mashed potatoes in her magazine and cookbooks. 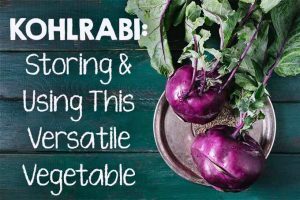 While this dish wasn’t overly popular at the time (mashed turnips were much more common), since then they have become quite the dietary staple. While sweet potatoes are native to the New World, they were indigenous to the southern hemisphere. Thus, this wouldn’t have been a food that was eaten by the Pilgrims. Discovered by the Spanish during their conquest of Central and South America in the sixteenth century, they eventually found their way to Europe. It took quite a while for this new food to make the rounds of the continent and finally arrive in England. Afterwards, the sweet potato eventually migrated to New England with the American colonists. 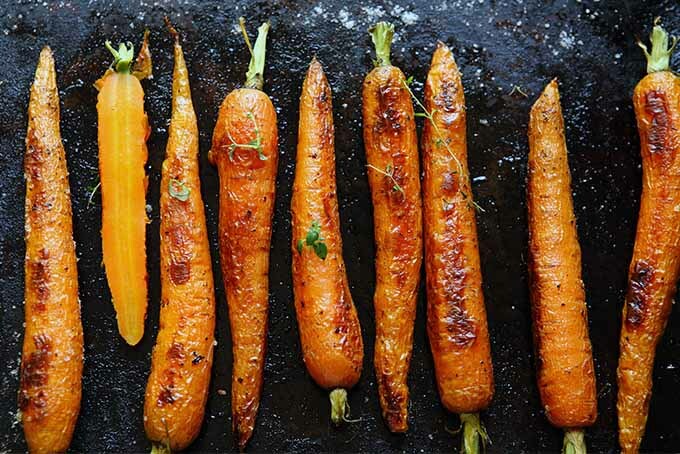 The first written record we have for a sweet potato recipe is from a 1796 American cookbook. 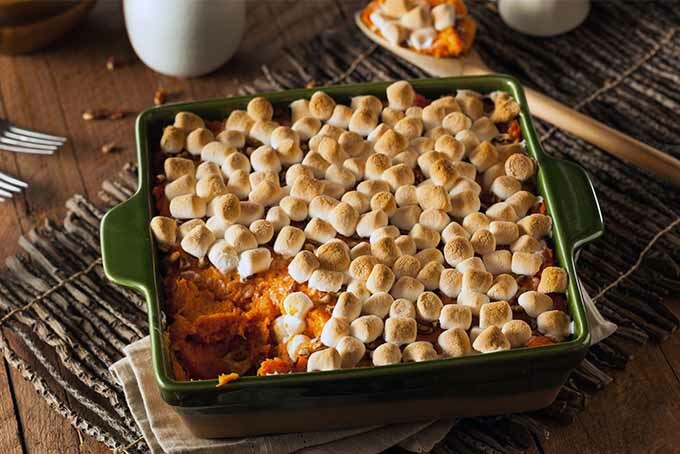 The first mention of a sweet potato casserole with a marshmallow topping showed up in 1917, and another example appeared the next year. This dish became increasingly popular throughout the 1920s. But in the late 1800s, machines were first invented that could manufacture marshmallows, making them an inexpensive and convenient ingredient to use in the kitchen. In the 1920s and ‘30s, marshmallows saw their heyday as a popular topping in place of meringue or whipped cream. 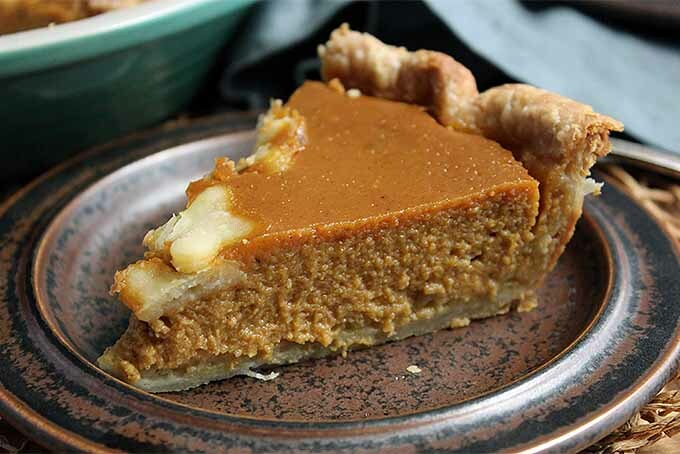 Pumpkin pie has been around for a long time. 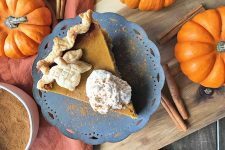 While the first Americans wouldn’t have had all the ingredients to make a crust or sugar to add to the pumpkins, they may have at least been familiar with pumpkin pie. 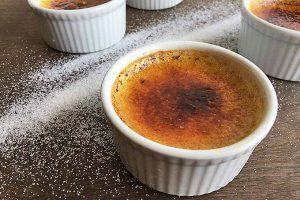 In 1654, a ship captain from Massachusetts wrote about this delicious dessert, while a French cookbook from 1653 includes a recipe for combining cooked pumpkin and milk and baking it in a crust. An even earlier New England recipe made do without a crust. It called for filling a hollowed-out pumpkin with milk, honey, and spices to make a custard, and cooking it directly in the still-hot ashes of a fire. Pumpkin Pie with Sage and Brown Butter – Get the Recipe NowBy 1796, two recipes for pumpkin pie appeared in the American Cookery cookbook. And one these resembled the type of pie that we are used to eating today. The Puritans may have lacked the basic ingredients and cooking implements required, but in pumpkin-growing regions, it’s been a staple of the harvest season ever since. 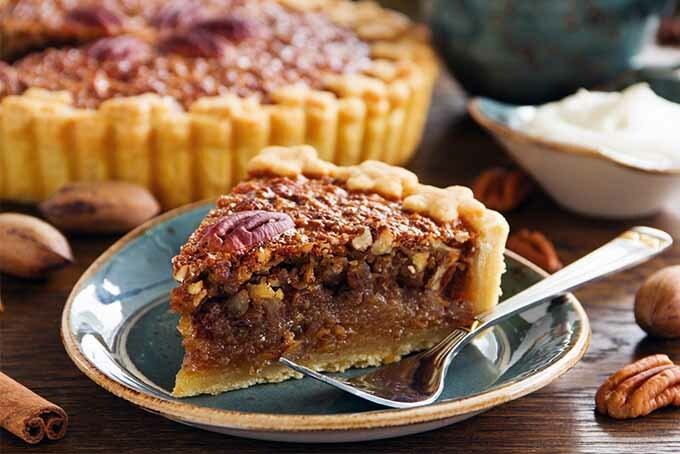 As far as desserts go, here in the South, pecan pie is just as popular – if not more so – than pumpkin pie for the main dessert on the fourth Thursday of November. But it was never included in Godey’s Lady’s Book. The very first mention of this sweet pecan treat was written down in 1886. But it’s possible that it’s actually been around for at least 150 years more than that. It is thought that the French, on settling the New Orleans area of Louisiana, might have been the first people to make pecan pie. 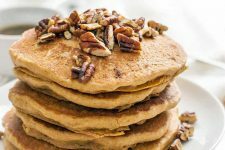 Historians know that they were first introduced to pecans, indigenous to the southeastern United States, by the Quinipissa and Tangipahoa tribes in that area. However the idea came about, pecan pie didn’t really take off as a popular American dessert until the 1930s. The story goes that the wife of a Karo Syrup salesman came up with the idea to replace molasses in a pie that she was baking with her husband’s wares. The Karo company liked the idea so much that they started printing the recipe on their labels, and by the ‘40s and ‘50s, their version of pecan pie dominated the South. If you want to try something new this year but you’re overwhelmed by all of the different ideas out there, take a page from my book – just think about what the Pilgrims prepared. They had no other options, so they cooked and ate only what was on hand. Food that wasn’t growing at the time of the feast was simply off the menu. For us, this means cooking with seasonal ingredients. Think about the produce that is being harvested at this time of year. Apples, broccoli, cabbage, carrots, cauliflower, chard, collard greens, kale, parsnips, pears, potatoes, pumpkins, sweet potatoes, and winter squash are all in season now. 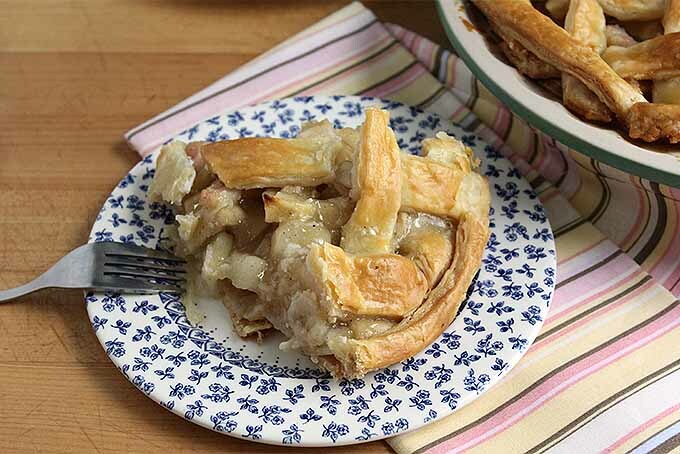 Apple Pear Pie with Cardamom and Ginger – Get the Recipe NowMove your pumpkin course from dessert to starter with this yummy pumpkin soup. 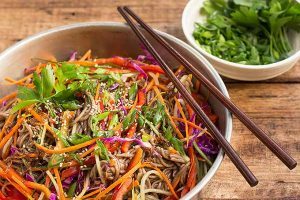 This is a really versatile recipe that may be made the day before, to make your day-of preparations easier. Serve it with some crusty bread, and you’ve got a great first course! If you’re looking for something with a big wow factor, these stuffed acorn squash with apples, nuts, and cranberries would be a fantastic side dish. Your guests will be so impressed, but it’s really such an easy recipe to make! If macaroni and cheese is a staple on your holiday table, give it a twist this year with this butternut squash-pancetta mac and cheese. The combination of the creamy sweetness of the squash and the saltiness from the pancetta really take this “kid food” up a notch. 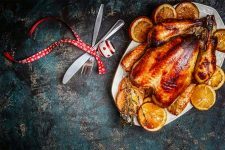 Thinking about steering away from the turkey this year? 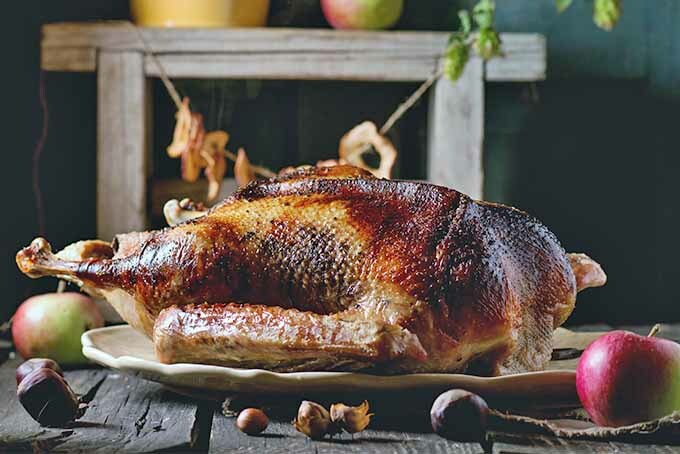 Read this post to find out the proper way to choose and cook a goose for your centerpiece instead. 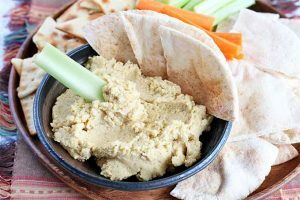 Or check out this post on other alternative proteins to serve at your holiday table. 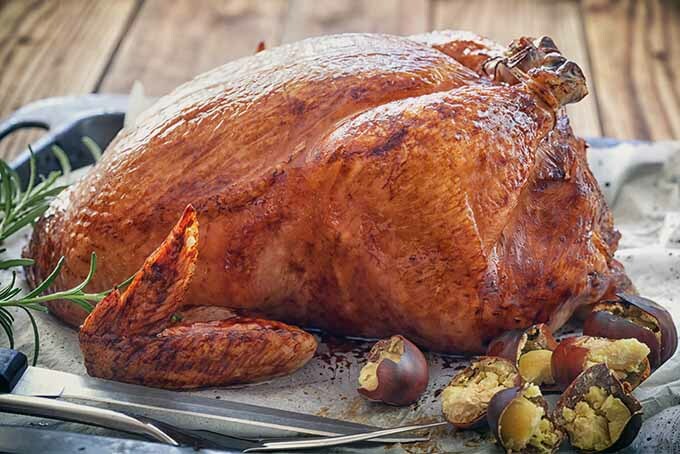 Goose is great alternative to turkey, and it’s also a meat that we know was served at the first Thanksgiving. What’s on Your Menu This Year? Whether you go for traditional foods or you’re always trying something new and different, I hope you’ve learned a little something here today. 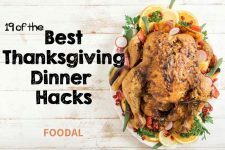 Try one of Foodal’s Thanksgiving recipes this year, and let us know how it goes! 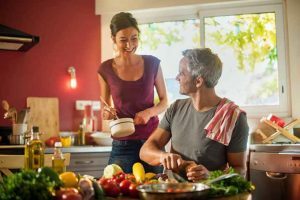 Or, if you’re after some smart tips to make the most out of your holiday dinner, check out these recommendations for stretching out your Thanksgiving dinner to get the most out of your mileage. Got bigger concerns? 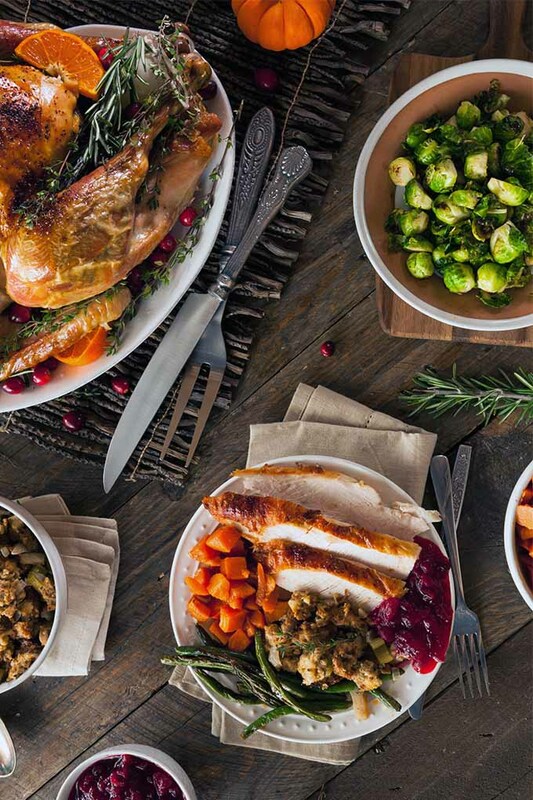 We’ve got tips on how to survive your holiday dinners, too. What are some of your annual favorites? Please take a moment to share with us in the comment section below! Pie photos by Kendall Vanderslice, © Ask the Experts, LLC. ALL RIGHTS RESERVED. See our TOS for more details. Uncredited photos: Shutterstock.